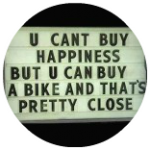 You can’t buy happiness – but you can buy a bike, and that’s pretty close. WheelSizeAgnostic is a bike blog with reviews, industry news and articles. product performance – all evenhanded and open-minded.